In the world of drifting, there are plenty of JZX110 owners who complain about their throttle response, hindering their performance in drifting. Here to solve that problem is Bee Racing's Mr. Imai who developed a simple device that eliminates that grief. The Direct Throttle System took approximately a year to engineer and it is a first of its kind for the Nissan Z33. Let's take a closer look at this ingenious product! In the modern manufactured vehicles of today, the majority are switching to an electronic throttle system typically the Toyotas, and now the Nissans. Many enthusiasts complain that there is a slight lag in throttle response after mashing the pedal. 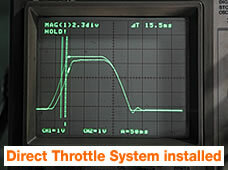 The Direct Throttle System fixes this bug, which is the time lag between the driver and the moving assembly. The first step when developing this devise was to study the motor that moves the throttle after depressing the pedal. The time it took for the throttle to react after the pedal was operated was painstakingly researched, as well as the potential of the motor attached to the throttle butterfly. 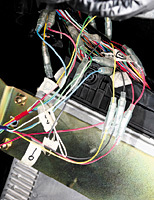 With the research data in hand, the Direct Throttle System was constructed to give a much needed linear reaction between the pedal and throttle. BEE*R is currently developing systems for the VQ35 and for the Fuga as well. After experiencing the feeling of vehicle response after installing this system, we are sold that it's impossible to go back to stock form. The vertical axis refers to the open pedal angle (voltage) / open throttle angle (voltage), and the horizontal axis refers to the time elapsed. The top line refers to where the voltage is applied when the pedal is depressed, followed by a line that represents when the throttle actually opens. With the Direct Throttle System installed, the difference of time it takes for the mechanical reaction is minimized to 0.155 seconds. 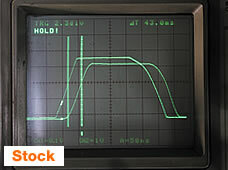 In stock form, that same reaction time is 0.43 seconds.